Starting the section on money and the economy today, and was looking for a picture of a dollar bill to show the attempts to prevent counterfeiting. Then a question suddenly came to me. Why the efforts at stopping counterfeiting? I mean, let’s look at it this way. We’ve been told that inflation is good, that printing money can lead to economic growth. Well, if a trillion dollars of quantitative easing is good, why not two? or ten? And if more money is good, then instead of arresting counterfeiters, why don’t we encourage them? Of course, there are obvious answers to this, most notably that the state wants complete control of our lives and no better way to do this than through legal tender laws and fiat currency. Simply make illegal anything but the state’s money, and viola’, instant control. Money is one of the great inventions of the modern world. Yes, it is an invention. It originated as a medium, a good, that both parties had and desired. They could then easily trade goods and services without suffering the double coincidence of wants. It was magic in a very real sense. For money alone makes possible the two greatest achievements of man: division of labor and comparative advantage. The ability to specialize and to trade have made mankind infinitely more prosperous. But for both to occur, they must be left alone, in as free a state as possible. Both are the highest forms of man’s expression of his liberty. I produce and trade with you, value for value, freely and mutually agreeable, without force or coercion. We are both better off for it. We need each other, and not in the socialist collective sense which is the antithesis of liberty. The division of labor and comparative advantage also are the greatest ways to prevent war. Why destroy my neighbor when I so need him? Why injure my neighbor when it causes me injury as well? Liberty is the bane of the warfare state. When we choose our money, the state has no control over us. If it cannot control our trade, it cannot control anything. So, obviously, counterfeiting drives a stake into the heart of the state and its yearnings to control. But the Fed has been on a counterfeiting rampage, not just the most egregious example of the past couple of years, or even the past decade and a half, but since its inception in 1913. It then seems rather ironic, to say the least, that the great counterfeiter, and the state that countenances it, are so opposed to counterfeiting. Of course, to be anything but would exposed its gross hypocrisy. If counterfeiting destroys a currency, as it most certainly does, then what answer could the fed give in defense of its actions? So it must lie and live a lie, that somehow its worthless paper is valuable. I’m not a believer in divine intervention, but surely, if ever there was a case to be made, it is this. For thousands of years, men have tried and have always failed, to counterfeit gold. Austrian theory is grounded upon the causal-realist approach. One must look at the causes of actions, and the effects of such. One cannot formulate intricate mathematical models and then pretend all is well. Austrians also understand well Hazlitt’s One Lesson that economists must observe not only the short term effects to one group, but the long term effects to ALL groups. And now we have the robo-signing fiasco. It’s funny how fast things happen, how the market distortions and discoordinations suddenly appear. I must admit, I heard about these robo-signed foreclosures and didn’t know what was going on. News stories were little help as they tend to (as their job requires) sensationalize the news and obscure facts (and certainly any theory, which they are woefully lacking) , highlighting the personal side as to gain the reader’s empathy. But at the center of the foreclosure scandal looms something much larger: the question of who actually owns the loans and who has the right to foreclose upon them. Yes, property rights. But this is problematic on so many levels. The fed’s debasing the currency, in effect meant that the money was fake and thus could be thrown around like halloween candy. As it was. Real savings is owned by someone, and you better beware when you lend someone another’s property. But when the money is fake, there’s no owner thus no accountability. So in reality, the issue of real property ownership was irrelevant, as well it would be. How can someone actually claim to “own” a home when they borrow fake money, to “purchase” at an artificially inflated price, with no money down, on an interest only loan, something they planned to flip and profit on within a year? And then the bank dumps the loan into a pool of other like loans, packaged and sold to a third party, all backed by the government, whether de jure or de facto. So is it the pool or the original loan? Who knows? Who even cares? For a housing recovery to occur, all the foreclosed properties — which could account for 40 percent of all residential sales by 2012 — need to be re-scrutinized by the banks and resold on the market. The author hits on something that I believe he is unaware of: that the recovery will only begin after the liquidation. This is massive waste. I’ve no idea who is right, nor will I even hazard to guess. What I would love honestly is how they can claim it is their house. Is simply signing paperwork all that is required to really confer ownership? They apparently had a loan, they apparently were not able to meet the stipulations of that loan, they tried to catch up (whether the loan was modified or not I do not know), and apparently the bank determined they failed to make good on their obligations. The bank then sold the home to another party. This mess is clearly a cause of the housing bubble, government intervention into the housing market, and of course the massive waste and malinvestment of the previous decade plus. And we see even more broken windows and long term effects of policy driven economy. Of course the solution that we’ll get is more regulation, more intervention, more destruction of property rights, basically more policy driven economy. Now, it’s possible that many of the claims are valid, that the foreclosures were based on fraudulent documents. Fraud is a crime, one of the very few things that is necessary for government to protect against, as it is the cornerstone of trade. Both sides agree to the terms of the trade, with knowledge being scarce and incomplete. That much is given and expected. However, fraud is very real theft and must not be allowed. And where did the real fraud begin? With the fed’s fraudulent money. When the money itself is bogus, everything follows. I can’t fault the banks, and honestly, I’m not sure I can fault the “buyers” either. Each was duped by government and fed policy and acted accordingly. We know fiduciary media causes huge coordination problems in the capital structure. But it appears that it causes even further problems as this episode makes abundantly clear. It even distorts real property ownership, and makes transactions impossible. Now, with so much inventory under a legal threat, the process will become severely delayed. Add this to the list of reasons to get rid of the fed, and all policy driven economy. Was looking around the other day for information on gas prices and came up with this (.xls) from the US Energy Information Administration. And, since it’s from the government, it must be true. 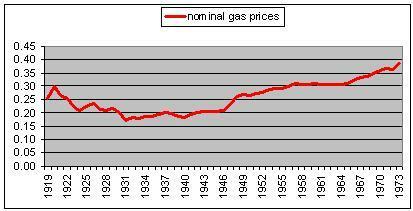 Here’s a chart showing the nominal gas prices from 1919 to 1973. For those not clear about what nominal means, it is the price unadjusted for inflation. It is the actual physical dollars and cents amount one pays for an item. Why this is so important is that modern economists love to use the term “real” which simply means adjusted for inflation. Why should it matter really, if you’re paying the same relative amount? Isn’t it purchasing power that’s significant? First, notice that nominal gas prices in 1920 and 1960 were the same. In forty years, what you paid to fill up your car was exactly the same as what your grandfather paid to fill up his car. Of course, there’s some differences. One, the car you’d be driving was substantially better and you’d have a multitude more places to go and things to do. And the number of cars had multiplied many time. We’d certainly expect gas prices to fall during the depression and the war. And we’d expect gas prices to rise after the war as millions new cars and drivers entered the market. But notice how prices rose gradually and eventually settled. This would be wholly consistent with Austrian theory as obviously consumer preferences had shifted, the price system reflected such, and producers moved resources into those areas more demanded. Given that gas production is very capital intensive, and a much higher order level of production, that prices rose over a several year period until settling would make perfect sense. And then for over a decade, gas prices remained unchanged. Though not shown on the graph, the “real” price of gas fell by well over a third. Back to the problem of “real” prices. Austrians stress the importance of the non-neutrality of money. Stressing “real” prices, i.e. adjusted for inflation, masks the true problem. Prices do not all rise at the same rate, nor at the same time. This distorts the economic calculations of entrepreneurs as well as consumers. That’s one of the reasons why it’s so important to show nominal prices. The other reason is of course that even without inflating fuel prices, the automobile sector of the economy flourished. And there was no lack of gas stations to fill those cars. Inflation is not required for growth. I could go on, but suffice to say, isn’t it interesting at the least to see how gas prices, the actual amount paid, remained virtually unchanged for 60 years. What are the ways out of a debt crisis? That surely should be the burning question in the western world today, on both sides of the Atlantic. What do we do now that we are in this situation? Well, ladies and gentlemen, in theory, there are six ways out, which I will share with you now. One is to raise the growth rate of your economy. The second is to lower the interest rate on your borrowing. The third is to get bailed out by somebody. That’s the route that at the very last minute the Greeks were able to go down. The fourth, of course, is fiscal pain. You increase taxes or you cut public spending and you try to run a primary budget surplus; you start, if you possibly can, to pay off the debt. The fifth is that you print money. That fancy term seigniorage is just a fancy term for printing money in order to inflate the debt away. And the sixth option is to default. There are all kinds of wonderful words for default that you need to know because they’ll be appearing in the Wall Street Journal and the Financial Times quite frequently in the months ahead. You can have repudiation, standstill, a moratorium, restructuring, rescheduling, and so on. But it all boils down to changing the terms of the original loan—default. Unfortunately, I have to strike out three of these six options right away because certainly from the vantage point of the United States, they’re very unlikely to materialize. It’s very hard for me to believe, given our present predicament, that we’re going to see a sudden upsurge in economic growth in the United States. I think one consequence of the financial crisis has been to lower the growth path of the United States. At this point we’ve seen some slight recovery in the US 10-year yield, but that, of course, reflects a flight to safety as investors have exited Europe. At the moment the view persists that US treasuries are a safe haven, the safe haven for investors. But as I pointed out in the Financial Times some months ago, US treasuries are a safe haven the way Pearl Harbor was a safe haven in 1941; safe but not for much longer. The nasty fiscal arithmetic sooner or later catches up with all sovereign borrowers no matter how strong they feel themselves to be—which just leaves fiscal pain, inflation, or default. Cut, print, or default. Ladies and gentlemen, history affords only one example of a country that managed to get itself out from excessive debt-to-GDP burden without either inflating or defaulting. The only case that I can find is Britain after 1815. For a long century, Britain paid down its debt through growth and through running primary budget surpluses. There was no default. There was no inflation. But this, unfortunately, is the only case that history offers us. And remember Britain did have some unusual advantages at that time. It was, of course, the first country to enjoy an Industrial Revolution. It also had the world’s biggest empire to draw on, and it had a nondemocratic franchise throughout the period, which meant the propertied were represented and the propertyless essentially were not. That makes it much easier to make tough fiscal decisions, believe me. So that just leaves us with two options: printing, and that’s much easier for a country with monetary sovereignty like the United States or the United Kingdom (it’s impossible for Greece, unless Monsieur Trichet agrees to print for them); or alternatively default, which I believe not only Greece but other eurozone economies will ultimately do because no bailout can essentially achieve the drastic contraction in fiscal policy that the Greeks have committed themselves to undertake. And I don’t believe that that contraction is politically viable. And in conclusion, he makes the great observation that when it happens, it’s very quick. There’s simply not going to be a long slow decline. Ladies and gentlemen, let me revert to Thomas Cole’s great life Course of Empire. The point that I’m trying to make is very simple. It’s not a thousand years that separates imperial zenith from imperial oblivion. It’s really a very, very short ride from the top to the bottom. Ferguson’s an historian, one well schooled in economic theory. I’ve no idea if he’s an Austrian in any sense, but one needn’t be an Austrian to fully grasp the depths of the disaster that looms. Yes, Hayek’s “Pretense of Knowledge“. The argument in Washington about extending the “Bush tax cuts” revolves around how much the cuts will “cost”. First, cutting taxation is never a cost, as not stealing something hardly counts as an expenditure. Unless of course we’re talking about the state, then yes, theft is a legitimate activity, and yes, not stealing is loss. Nonetheless, how do they “know” that the cuts will mean $700 billion in less tax revenue? It is impossible to determine. They do not know, can not know and certainly with such precision. The answer is again their formulas and models, which never fail, except when they do. And fail they always do. Likewise, the $41 trillion in new spending (projected) is again based on their mathematical formulas which as we know are always correct, except when they’re not. And wrong they always are. I agree that the marginally less theft will have a trivial impact on the future federal budget when compared to the massive expenditures, as well as the unfunded liabilities added on top. That’s not the point. The point being that there is simply no way to determine in any fashion the exact amount or something even remotely close. That is the pretense of knowledge. Any numbers you hear, from any side in the debate will be wrong. Always, and by a large degree. The only solution is simply less: taxation, spending, and in general, government. The first step would be to simply admit that and realize that the postivist models are what is the problem. But new regulations being proposed by the Department of Education would undermine that goal by presenting more obstacles to students seeking to attend the higher education institutions that work best for them. For-profit institutions, which would be most affected by the new regulations, serve a student population that has been underserved by traditional higher education. Well of course this administration will do everything to undermine freedom to contract and choose, and anything that makes a profit. But wait, that’s not the real story. The problem is the federal regulations on which schools can enroll students receiving federal loans and grants. If the “for profit” schools are being subsidized by federal grants and loans, then they’re not “for profit”. Profit occurs only in the free market when consumers and producers use the price system to coordinate, and producers deliver a product, at a price above production costs and lower (or equal to) than the students marginal utility of said product. If you want to get in bed with leviathan, you play by its rules. Hillsdale college accepts no federal subsidies. They don’t have to play by rules set by the state. Their graduates have a product, a Hillsdale degree, which allows them to compete in the market place. The market determines the value of the product. I simply don’t see the problem with the regulations. I mean, from the standpoint of federal intervention into education via regulation and subsidization, I have a serious problem. But for those school that want it both ways: freedom to create a product and subsidization from the state, I can only say too bad. Like all policy driven economy, it is a trail of broken windows. Okay, so maybe it’s a little late to restate the obvious, but I found this little gem recently from the NY Times back in March. Well, good to see so called mainstream publications admit the obvious. But is the first part really correct? In short, no. So, is health insurance, or any insurance for that matter, a sucker’s game? Hardly. The problem is that pooling is done mostly through force which is why the market distortions occur. And it is a very profitable venture for two of the three parties involved: the insurers (and is it ever profitable) and the over-consumer. The third, who is forced into the system, who under-consumes, is the victim in every sense of the word. Pooling done through choice however is not only valuable, but vital, for a free economy. However, buying a pair of shoes comes with the risk that usage will cause painful blisters. In other words, the cost would be actually higher than just the pants. It would be pain and discomfort as well. Of course, some women will consider that the price of fashion!! Some stores have fairly liberal return policies regarding shoes and lest anyone think otherwise, that policy comes with a cost and it is figured into price of every pair of shoes. It’s true. But, it is why people prefer to buy shoes from a store with such a return policy. So, assume one buys a pair of shoes from a store with a liberal return policy, and the shoes do not cause them pain. They still paid the premium for the return policy but they did not get back their money spent on such. What they actually bought was peace of mind, thus they remain equally satisfied. No, insurance if it is truly insurance, is never spread across others, especially those not involved in the transaction. Involving others can only occur through force. Insurance is something you don’t plan to use which is why health insurance, as most people view it and use it, isn’t insurance at all. It is instead what is called cost shifting, whereby you are consuming at a lower price, more than you otherwise would given accurate market prices, while the rest of the price is picked up by others. What makes this palatable, at the very least, is that presumably the costs are borne by many and the extra cost incurred is small. I am not claiming some unique insight, just the basic economic understanding that is the necessary part of the discipline. And it is those core fundamentals which the Austrian school is grounded upon. Insurance is not theft, pooling always is. You are currently browsing the Never Giving In blog archives for October, 2010.